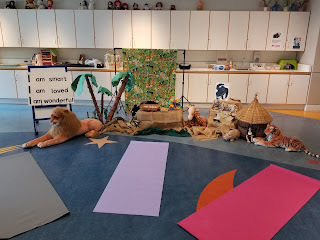 Welcome/Introduction: We introduced ourselves and briefly talked about the benefits of doing yoga with kids (breathing helps kids think better, yoga poses help build strength and flexibility, etc.). Opening Song: I made up a song to the tune of "Goodnight, Ladies". We clap along and sing to each person in the room. It's time to do yoga! Then we pass out electric tea lights and place a plate in the middle of the circle. We talk about our inner light and what that means. Then everyone places their tea light on the plate and we tell them how our inner light shines brighter together. Breathing: We show kids how to breathe correctly in yoga using a Hoberman sphere as an illustration. We first ask them to hold their breath and tell us how that feels. Then we have them take short, shallow breaths and ask how that feels. Finally, we practice breathing correctly. Then I teach them a new, different kind of breath. This week's was Lion Breath. First we sit on our heels nice and tall like lions. Then we take a big breath in through our nose, then breath out through our mouths and roar! We can even stick out our tongues on the exhale like lions do. Warm-Up: Next, we do a warm-up to get our bodies ready to move. We use the "Wake Up" routine from the DVD Once Upon a Mat. Then we do a Sun Salutation sequence. We begin in Mountain Pose, then raise our arms (inhale), forward fold (exhale), half-way lift up (inhale), forward fold (exhale), roll up to standing with shoulders raised (inhale), and lower shoulders back to Mountain Pose (exhale). We repeat 2-3 times. Introduce Theme: Now we introduce our theme for the week! For this jungle theme, we went on a safari. We used the poses from the Pink Oatmeal website. We began in jeep pose. Then we drove along until we spotted different animals, then posed like them. We found a lion, giraffe, snake, gorilla, and elephant. Book: Today we read From Head to Toe by Bill Martin Jr. and did the actions. Activity: We always do some sort of group game before we wind down for the today. First we sang "No More Monkeys" from the CD Animal Playground by Putumayo. We had a bunch of monkey puppets so each child got to dance with one. Then we practiced tree pose and made a forest all together. Relaxation: Then we tell the kids that at the end of each yoga practice, we relax and breath. We have the kids lay down on their mats and give them "breathing buddies" (a.k.a. Beanie Babies or other small stuffed animal. You could also use bean bags.) 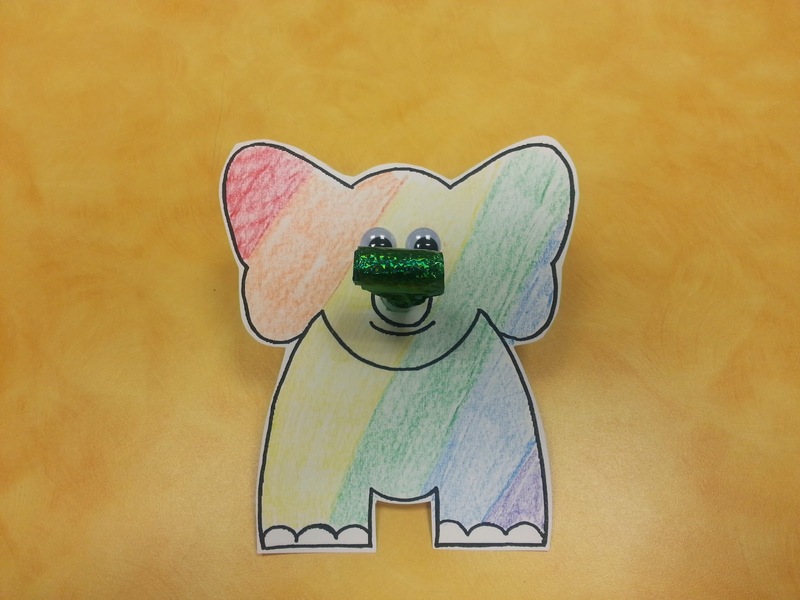 We ask the kids to close their eyes and give their breathing buddies a good ride. Then we put on some soft music, such as the Acoustic Yoga CD by Putumayo. After a couple of minutes (or less depending on the mood of the group), we ring a chime and invite the kids to wiggle their fingers, toes, stretch and sit up. Each child gets a small bottle of water to drink while we talk about the play activities for the day. Play: This week we had 3 stations - jungle dramatic play, follow the animal tracks, and an elephant noisemaker craft. 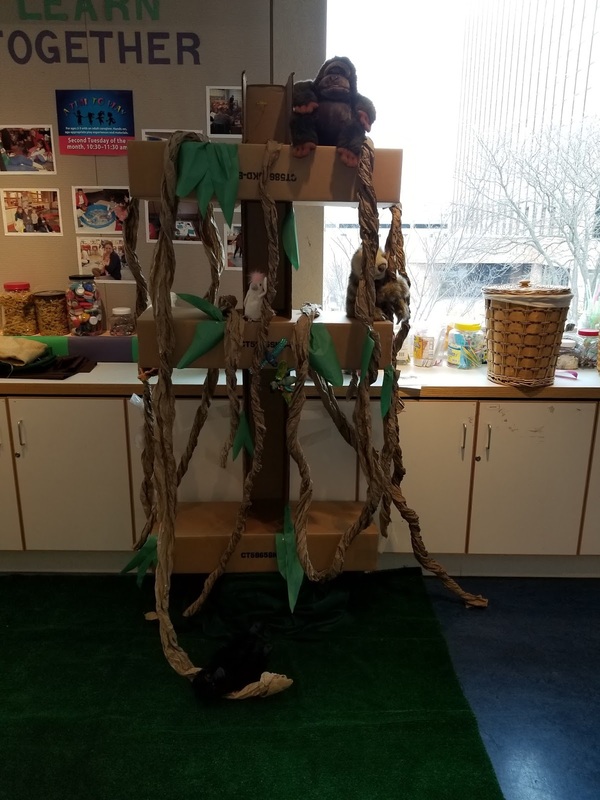 We had this random cardboard structure, so my co-worker and I made vines and leaves out of packing paper and construction paper. Then we put down fake grass and set out various jungle animal puppets for free play. 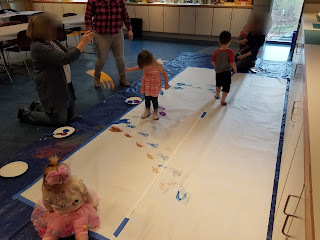 We printed out 3 different animal tracks on long paper. Then we taped them to the floor and placed stuffed animals for each track in a basket. I did this craft for my Jungle Storytime a few years ago and I still had leftovers pieces. 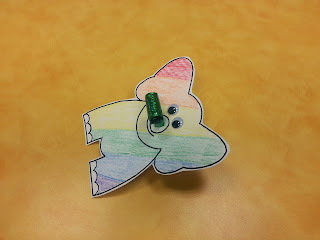 Kids just color the elephant and put the party blower through the nose. Then they can pretend to be an elephant! At my current library, we host several programs for babies, preschoolers, and school-aged, but admittedly there has been a lack of options for the toddler crowd. So I decided to try a program I've done at my previous job: Toddler Art Explorers. The idea came about when I started getting really tired of doing crafts (or product-based art) in my programs. While I know they aren't all bad all the time, I found that I was doing a ton of prep work to have the kids make something that they'd probably throw away when they got home. Then I started reading about process art, which seemed more up my alley. With process art, there are no instructions and no right or wrong way to do it. It's about kids experiencing the material any way they want to. It helps children develop fine motor skills, vocabulary, and social/emotional skills through self-expression, among others. You can find some information about the research and reasoning behind doing process art with kids here, here, and here. Geared toward children ages 12 months to 3 years-old, the basic idea of the program is to set out different art materials, give families the basic premise of the art project, and then let the kids explore. I can't take credit for coming up with the original idea for this program. I took lots of inspiration from the Library Makers blog. I set out pieces of bubble wrap, white card stock, washable paint, and paintbrushes. 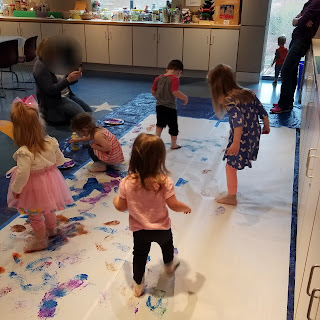 The basic premise of the activity was to have the parents tape the bubble wrap to the table so it wouldn't move around. 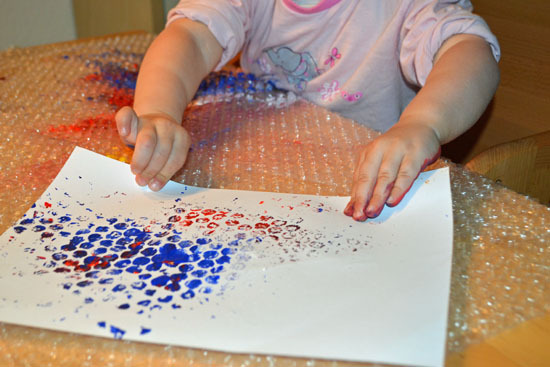 Then the kids could paint the bubble wrap as much or as little as they wanted. When they were done, they could press a piece of card stock to the bubble wrap to make a print! ** The interesting thing for me that I've noticed every time I've run this program is how difficult it is for the parents to just "let go" and allow their child to lead the project. As much as I hammer it into them, they still want to take over and direct. It's an ongoing battle. for this portion of the program! But here's the general idea. I also like to incorporate a big group project. For this session, I laid down a giant tarp with big white paper on top. I had the parents make bubble wrap boots for their child's feet. Then they could either paint their bubble wrapped feet together or step in the paint on a paper plate. Then the kids could dance/move around on the paper. I put on some dance tunes and they were off! I thought the bubble wrap boots would either be a huge hit or a huge disaster. Luckily, it was the former. They also liked making the individual prints and one child decided to just paint directly on the paper. Parents commented on what a neat idea it was that they hadn't thought of before. So overall, a win-win! Even as someone who's been in the library world for a few years now, I'm constantly looking to improve myself through webinars/workshops/etc. And I find myself searching for those learning opportunities that go beyond the basics. So I was extremely excited to read about a new initiative from Lindsey Krabbenhoft (of Jbrary fame) and Christie Menzo called the Library Services for Children Journal Club! So what is it, you ask? 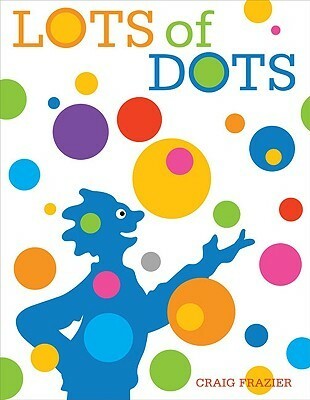 It's a resource to help children's library staff stay current on topics that are relevant to our work. How does it work, you ask? Every other month, those who want to participate will have the chance to read and engage in discussions on a selected topic. This could include an in-person group meeting (if there's one local to you) and/or online discussion. This is a great (and free!) way for children's services staff to develop themselves professionally and to think more critically about why they do what they do. And hopefully it will also encourage participants to foster dialogues with colleagues. I'll definitely be sharing this initiative with my professional learning network and I invite others to do the same. I would love to eventually create a meetup for those in my area, so if any readers are from the Ohio area, let me know! For more information, just click here. I hope to see lots of people talking about it online using the hashtag #lscjournalclub! use your vacation time, breaks, etc. Anything to add for alleviating burnout? Leave it in the comments! Yesterday, I hosted my very first YA Smackdown session at the Ohio Library Council's Northeast Chapter Conference. For those of you who have no idea what I'm talking about, YA Smackdown is an informal sharing session for teen librarians similar to Guerrilla Storytime. I put some challenges in a bucket and asked the audience for volunteers to choose one. They then read the challenge and answered it, then anyone else in the room could also contribute a response. What horror movies are your teens currently into? I would let the teen know that I have a job to do and that they are part of the atmosphere here and they should go be part of it. It depends on what's going on that day. If it's not busy, I let them hang out. I'll ask them to help me with a task to keep them busy. I'll show them the new books to pore over to occupy them. Favorite way you’ve recycled program supplies. Put them in the recycle bin! Host a Bad Art Night - Ask teens to make the worst looking art they can! I had all of these leftover Goldfish crackers and licorice I would try to put out and no one would eat. When I hosted a program, I named these same snacks something to go with the program theme and they tore through them! Naming the food something clever enticed them to eat it. What is your favorite teen book that deals with issues of body image? What would you do if a non-teen came to a program? Does it make a difference if they’re too young or too old? If it's someone younger, I explain about the program being developmentally inappropriate. If it's someone older, I explain that this is a space for teens to be able to be themselves with other teens. What is your favorite readers’ advisory resource? What board games are popular with your teens? Audience Question: Does anyone have a mobile makerspace in your library? If so, what does it look like? We store stuff in a cabinet and rotate the equipment out. We have basic things like Sphero and K'nex. People can sign up to use the equipment for 15 minutes at a time. Audience Question: How do you engage teens after school with severe lack of space and a security guard that intimidates them from staying? Unfortunately, this question was asked at the very end of the session so we didn't have time to get responses. If any readers have a solution, please share in the comments! If there are any needed edits to responses, or if anyone has a good response to add, please comment below! Hello again! It's been quite a while since I posted. I've been busy serving on the 2017 Newbery Committee, which was an ABSOLUTELY AMAZING experience. 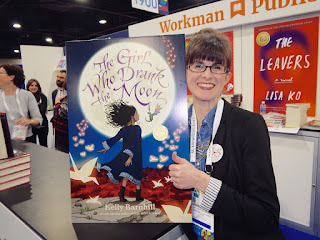 I could go on and on and on about what I experienced this past year, but Abby the Librarian already has it covered in an excellent post with all of the details. But after a brief recuperation period of doing nothing but binge-watching television, I'm definitely ready to finally start blogging about books, my programs, and storytimes again. As well as reading for the Newbery, I changed jobs! I am now an Early Literacy Librarian at a small library branch. I do still get to work with tweens and teens, but now my main focus is on kids from birth through 2nd grade. It's the first time that I've basically been a department of one, which brings about its own strengths and challenges. I'm also doing a LOT of outreach visits now, so I'll be blogging my outlines for those. I've been in a bit of a reading bubble, so I'm kind of out of the loop with what's new and exciting reading-wise. 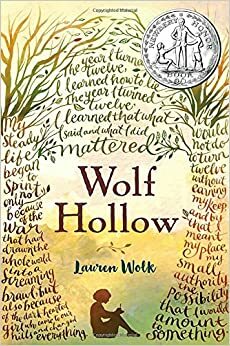 Any middle grade, teen, or adult recommendations? I don't know about you, but at my library, Minecraft is as popular as ever. I host a monthly Minecraft Club where we play on a server together. I also host one-time build-off competitions for both tweens and teens. So I was trying to come up with some new ways to integrate Minecraft into my programming, when I stumbled upon Mineways. Mineways is a free program that lets you export your Minecraft creations into models for 3D printing. It's really easy to use! My IT department downloaded the software onto our computer lab PCs and we were good to go. The day of the program, I start out by opening up Minecraft and going over what all the options mean in Mineways. The nice thing about Mineways is that a lot of the 3D print configuration setting are done for you. So you really don't have to mess around with it too much unless you want to. To create my outline, I used this page (scroll down to Export Options). Then I let them take about 90 minutes to build something in Minecraft (on creative mode, single-player, though you could let them partner up to build something together) and upload it to Mineways. Then I save their prints to a flash drive with the file name as their first and last name so I don't get them confused. I let the teens know that it will take a few days for their prints to be ready to pick up. The program itself went really smoothly. I was able to walk around and help the teens with exporting their designs. We created a shortcut to a free .stl preview site so teens could make sure their Minecraft creations would translate well as a 3D print. If not, they could then go back and fix their design. Depending on the 3D printer you have (we have a MakerBot Replicator 2), you may have to warn your teens that it won't print smaller, more detailed things from Minecraft like fences or flowers, even if you choose to "Export lesser, detailed blocks" and it shows up okay on the .stl viewer. I had to call a couple of my teens back in to redo their designs because they wouldn't print correctly. Have you done a Mineways program? Or have you used a different program, like Printcraft? If so, how did it go?